B: Resources. Do I want to waste either of our time pointing you to some good resources? If there’s one thing our cup overfloweth with in 2018, it is resources. Lent: A time of prayer, fasting, almsgiving, and projects. Project #1: What are you giving up for Lent this year? This year I’m keeping it simple: no coffee. Project #2: What extra meditations are you adding to your life this season? I’m keeping it simpler than other years, but still a bit complicated. 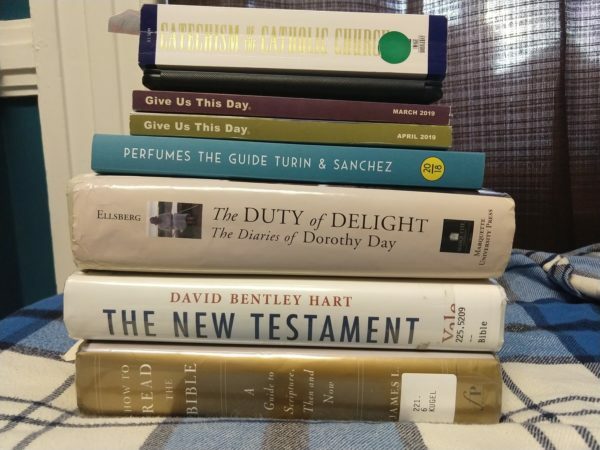 Inspired by Rod Dreher, and with the support of my Dante book club, I’ll be reading the Purgatorio (Divine Comedy, Part II). Assuming all of the above goes according to plan, it should be a successful Lent. For those looking for more resources, Susan Stabile always posts great stuff. I am going to fight the temptation to browse these resources when I should be reading Dante. I will especially avoid spending too much time thinking about Forty for 40: A Literary Reader for Lent. This year, it is back to basics. I am keeping things simple for Lent. Fasting: Facebook still seems like the perfect thing to “give up.” As a vegan, I’ll be skipping an extra meal on Fridays rather than fasting from meat. Prayer: Give Us This Day is still my go-to prayer book. Susan Stabile has a good roundup of other resources. Almsgiving: MINE OWN BEESWAX again this year. I hope everyone reading this has a powerful Lenten season. If you’re curious about Lent but not religious, I’ll point you to Jacob’s essay on the topic. From a WATCH: Women and the Church prayer card. Request or command? Obedience or elated acceptance? Surprise us, O God with your demands. Inspire us with your grace. courage and joy, to new challenges and opportunities. and nurturers of Christ’s body be welcomed amongst us. 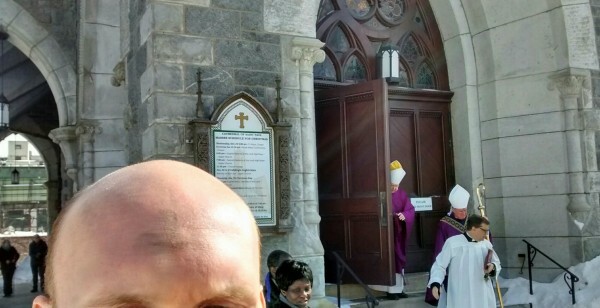 Palm Sunday mass is complicated for a lector. Not only is there an initial entrance into the church with blessed palms, but the Gospel is read like a play, with parts played by the priest, various deacons and lectors, sometimes people selected from the congregation, and even the congregation itself (roaring “Crucify him! Crucify him!”). 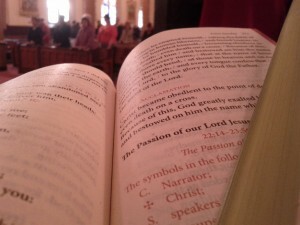 When I was first learning to be a lector as a teen, Palm Sunday was my trial by fire. Fr. Ed Bell gave constant feedback in the form of smiles and dirty looks. He always presided over a great mass, and I think his priority was never individual excellence or self-expression, but universal competence. If the details are attended to, the mass will be not only worshipful but nourishing to the heart. I was a lector tonight at St. Peter’s, and it went great. I appreciated that Deacon Reisinger, in his homily, drew out one of the lessons of Easter, that “hope springs forth,” and connected it to the wonderful event of the election of Pope Francis. It was clearly a publicity stunt geared to embarrass police and the city. 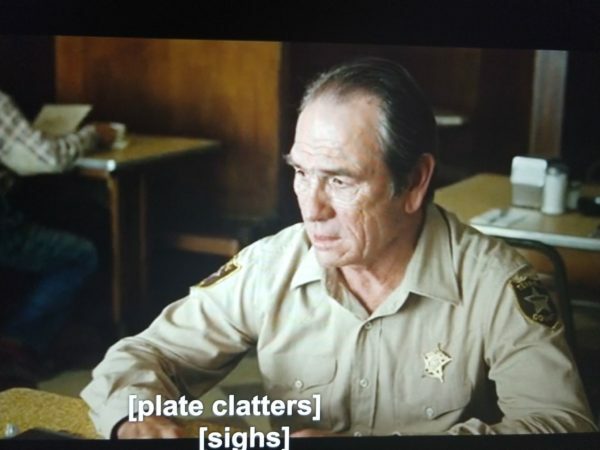 I’ll leave it to [the police department’s] judgment as to how they handle it. 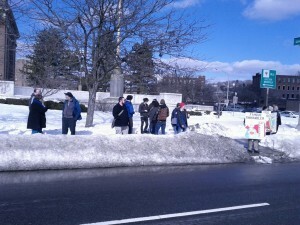 We were made aware that there would be a peaceful protest focusing on poverty and the panhandling ordinance. Based on the communication that we received from Saint Francis & Therese Catholic Worker, we know that the protesters are well aware of the ordinance and we gave them latitude to peacefully conduct their protest. Our approach to panhandling has been stated publicly. Our focus has been on education and gaining voluntary compliance. If enforcement action is necessary, we will take it . . . But we will not make arrests for the sake of making arrests. Today, between 1:00 PM and 2:00 PM there were 21 calls for service throughout the city. None of these calls were regarding panhandling. During this time period, we directed our limited resources where they were most needed. We used discretion to monitor the protest, and our decisions were made in the best interest of the entire community. As much as I’d like to quibble with these words, I’m not going to do that, because the upshot of the city’s actions is so interesting. In an act of civil disobedience against Worcester’s new anti-panhandling ordinances, three Worcester residents today begged for money on the median in Lincoln Square, directly across from police headquarters. The event was held on Ash Wednesday, the beginning of Lent, which Christians mark with prayer, fasting, and almsgiving. Gordon Davis, a blind anti-discrimination advocate, held a bucket reading BLIND and represented the disabled. Scott Schaeffer-Duffy, a Catholic Worker who has housed the homeless in Worcester for decades, was dressed as St. Francis, himself a beggar. Robert Peters, a long-time Buddhist meditator, dressed in the robes he wears as a lay Buddhist. At least four people called the police to complain. According to the supporters demonstrating legally on the nearby sidewalk, the only police response was one officer giving the thumbs-up when he drove by. None of the beggars was arrested, cited, or warned. “This is a victory for Worcester,” said Schaeffer-Duffy. Womag has more pix. 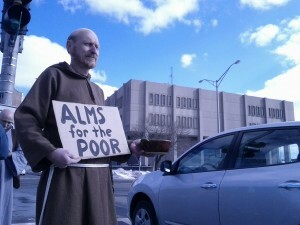 The T&G reports “$14.68 collected,” all of which will go directly to those in need. What did we give up before Facebook? Facebook is a great thing to “give up” for Lent. It’s not the worst thing I can do with my time, but the line between “connecting with friends” and “spending an hour clicking aimlessly” is easily crossed. Back when I was a big TV watcher, giving up TV for Lent always seemed like a good idea, but not a very practical one. Even if the time I spent with my family in front of the tube was not “quality time,” it was still a social activity and a shared experience. Both TV watching and Facebook are strange in that from one angle they’re very solitary, and from another communal. At its worst, watching TV lets strangers program my brain as I sit staring; Facebook, at its worst, is an exercise in narcissism. So since I always feel like “I should spend less time on Facebook,” and since I have no lack of other ways of catching up with folks, I’m giving up Facebook again this year, and replacing some of that newly-freed time with morning and evening prayer. I’ll be on the road a lot of Lent, so I’m putting off deciding what to give up on Fridays in lieu of meat—I’ll try various dietary experiments and see how they go. 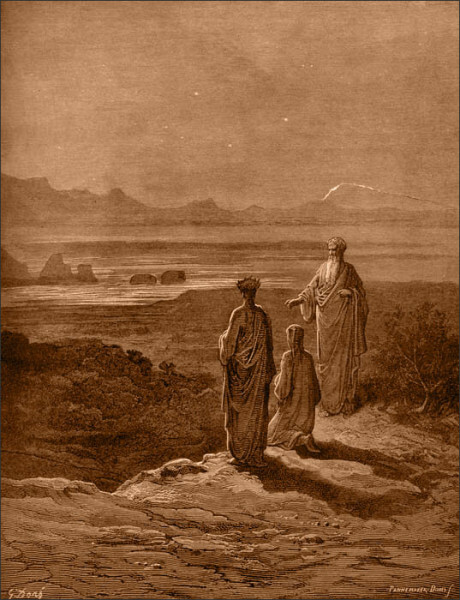 River Sims of the Temenos Catholic Worker is doing an online Lenten retreat on the Gospel of Luke. Susan Stabile is posting materials from this year’s Lent Retreat in Daily Living. 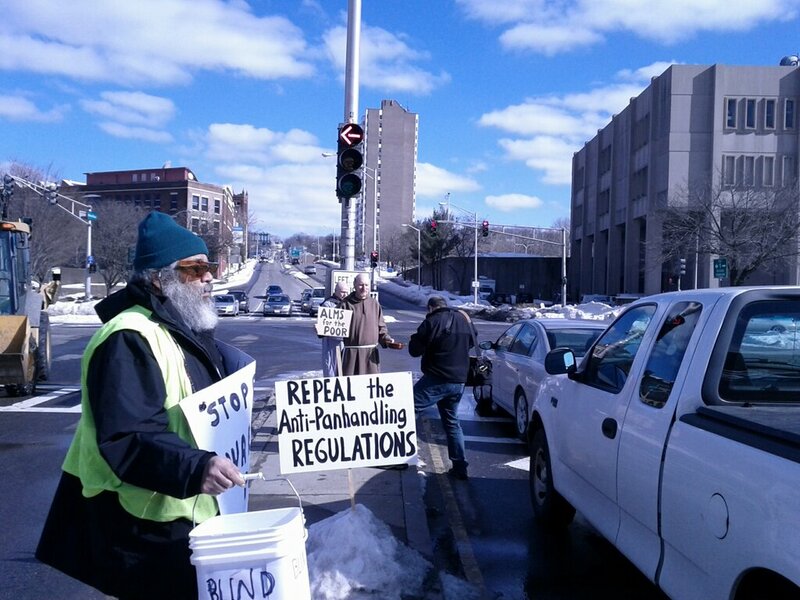 On Ash Wednesday, February 13, from 1-2 pm, the Saints Francis & ThÃ©rÃ¨se Catholic Worker community will sponsor a protest at Lincoln Square in Worcester calling for the repeal of anti-panhandling regulations passed last week. Signs will be held and the attached leaflet will be distributed. 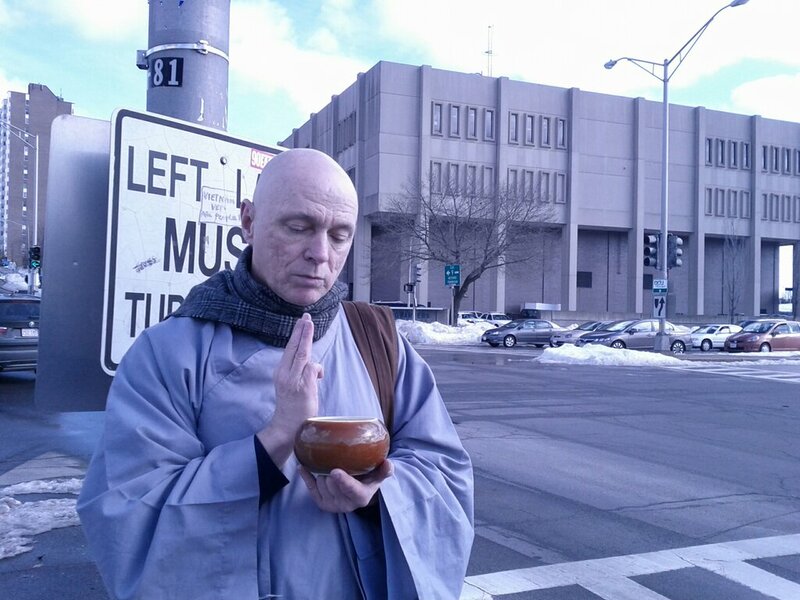 Robert Peters, a long-time practitioner of Buddhist mediation, will wear a monk’s attire and hold a beggar’s bowl. Scott Schaeffer-Duffy, a one-time novice with the Capuchin-Franciscans, will wear a Franciscan habit and also carry a beggar’s bowl. 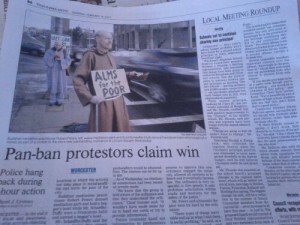 Robert will be on the sidewalk, while Scott will defy the anti-panhandling ordinance by begging on the median strip. Both of them hope to highlight the sacred place begging and giving to beggars has in all the world’s major religions. The members of the Catholic Worker community have sent the attached letter to Worcester’s police chief, mayor, and all the city councilors describing their reasons for holding this protest. Any funds collected will be given directly to those who who continue to feel the need to appeal for help on the streets of Worcester. For more information, call Claire Schaeffer-Duffy 508 753-3588.